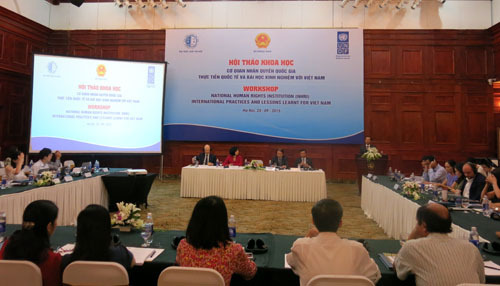 HA NOI (VNS)— Viet Nam should learn from other countries' experience to select the most appropriate model for a national human rights body, an expert has said. At a symposium in Ha Noi yesterday, vice director at the Ha Noi Law University Chu Manh Hung said that national human rights agency models varied by political and socio-economic systems and there was no common model for all nations. Viet Nam needed to ensure representation in its national human rights agency, said Nguyen Thi Hong Yen, vice dean of the university's Faculty of Public International Law, adding that representation would help guarantee the objectiveness, equality and multidimensional approach of the body's decisions. Regardless of the form of establishment and scope of authority, the organisation's operations must be part of State agency activities to better protect human rights. Associate professor Dr Hoang Van Nghia from the HCM National Academy of Politics and Public Administration said a specialised agency was instrumental in ensuring human rights. The group should be organised on the basis of international regulations and practices while adhering to socialism-oriented directions and the Party leadership, he noted, adding that it was necessary to design a thorough roadmap to set up the agency.